The Century® Sterilizer meets the needs of today’s O.R. and other areas of the hospital. 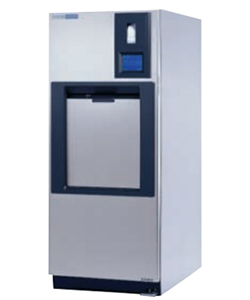 The Century® Sterilizer features foot pedal operation of the automatic sliding door for hands-free loading and unloading. The vacuum fluorescent tough panel permits direct operator cycle selection. The large display of time remaining during the cycle allows the operator to perform other tasks while awaiting cycle completion.